I have one machine with the latest viewer installed(6.7.0.2) and the host has the same version(6.7.0.2). My machine also has the latest version. On my machine I am able to print successfully to my printer from the remote machine. However, on the machine I need this to work on it appears to work until the pages come out. When they come out they are blank. Is this simply a driver issue? My machine is using a post script driver and I am guessing but I think the other machine is using a pcl driver. I know this feature works but something is causing it to print blank pages. I forwarded this question to our developers to see if they can provide any input. I'll get back to you soon with an answer. When printing, do you see the page preview in this window - see screenshot ? Yes I see the popup and I can tell it to print all or print selected. The printer activates and spits out a blank page even on a test page. If you can see the preview on the Viewer side, then it should print without a problem, as this is nothing more than sending a PNG file to your printer in a standard way. Try to print something else on your printer directly. For example, a PNG file. Or you can also use the Save button in the preview window to save the file first and then print it. I have tried both PCL6 and PS drivers with no resolution. I can save the image and print it out but this is cumbersome for most people to understand. I am thankful that the person I am testing this on is understanding and willing to test. Is there anything else on this one machine that could be stopping the printer from printing directly from RU Viewer? So it works when you save then print, and doesn't work when you print by clicking "Print all pages" or "Print selected page" buttons, correct? That is absolutely correct. Please keep in mind that the printer does activate but spits out a blank page. 1. Download and run the file on the Viewer machine. 2. 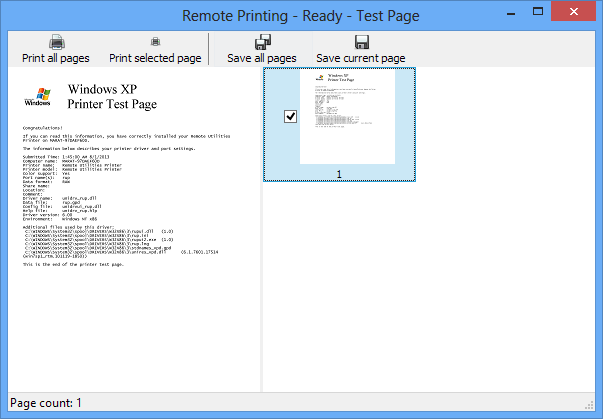 Click Browse and select the png file that you saved in the remote printing dialog window. 3. Try to print the file on your printer using the three buttons (first Print 1, then Print 2 and finally Print 3). 4. Let us know if you were successful with all the three buttons, or if some of them failed (and which ones). Thank you for continuing to help us out on this issue. Also Test print 3 worked only 2 out of 3 times for an unknown reason. First print worked, second print did not and third worked again. This is also causing the printer to halt due to paper size mismatch and forces user to manually continue with the print job from the printer menu.